Hope This Helps You: Multi-Colored, Self-Striping and Slow-Changing Yarns, What's the Difference? Multi-Colored, Self-Striping and Slow-Changing Yarns, What's the Difference? Note that I am a newbie crocheter. 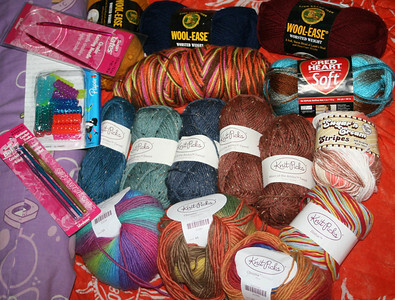 And yes, this will also be a sort of review of some specific brand yarns. 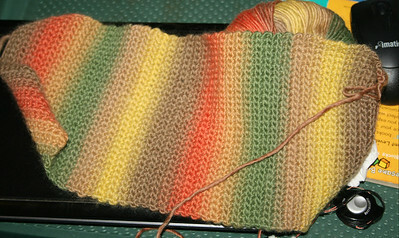 Back to the title question though, what is the difference between a self-striping and slow-changing yarn? Actually, a slow-changing yarn just means that the color changes very slowly within the yarn that you see it transitioning to another color. A self-striping yarn however changes color almost abruptly, with the manufacturers having computed already where to dye the yarn to create a stripes design. I actually prefer the two over regular two-toned or multi-colored yarn... because with multi-colored yarn, it usually ends up looking a mess because there's really no pattern to the color changes. Allow me to share pictures. this is a hacky sack I crocheted using the Sugar n Cream Stripes yarn... notice how the stripes/change in color is very distinct (it's like I actually changed yarns). And by the way, I loved this brand because it's pure cotton and is safer for creations that kids will come in contact with... but it also felt a little stiff in my hands. The label also suggests a 5 mm crochet hook but I think I used a 4.5mm one for this project. 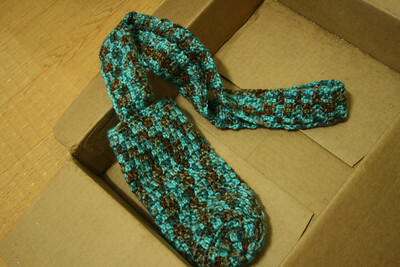 Now this is a scarf I am crocheting using the Chroma slow-changing yarn. It still looks a little like it's creating stripes but the color changes slowly lending a softness to the outcome that it feels more like a painting, rather than a print. I LOVE the softness of the Chroma yarn but maybe because it's wool, there's a greater tendency for the fibers to get mixed up/attached (so unravelling several rows due to a mistake was a pain!). I also didn't like that the yarn thickness isn't uniform so I keep having to adjust tension as I go. Once, I also even worried that I made another mistake because the edges won't come out even/straight, but it's really the changes in yarn thickness that's creating some dips along the edge. This yarn is rather expensive though (around $10 per ball at Knitpicks), which is why I am using it for a scarf for my Mom. I used the Red Heart Soft yarn (and said yarn IS very soft, a dream to crochet with) from the first picture in this post to create this bottle holder... I think it still looks nice because the two shades somehow ended up creating some sort of pattern (something about the yarn not switching colors too soon). But this yarn, maybe because it's so soft, was a wrong choice for a bottle holder that keeps getting used because it pills more easily and stretches (so now, this bottle holder is longer than the bottle it is supposed to hold, haha). 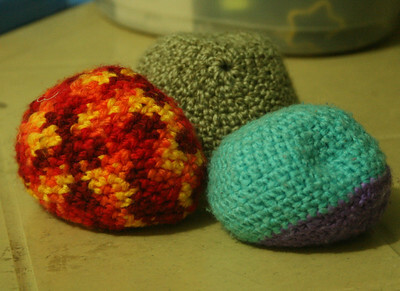 Note the red hacky sack made from a local Red Heart yarn blend. It's a multi-color and fast-changing yarn that there seems to be no pattern here. In a hacky sack, that's okay but if you create big projects (like a hat or vest) with this yarn, chances are, the finished product will just look dated and less finished. This acrylic yarn, however, doesn't pill easily so it's really perfect for hacky sacks (P19 if you buy a small 35-m ball from National Bookstore). Now... where did I get my yarn? I got the special ones abroad and had my sister ship them to me. I think you can get self-striping and two-toned/multi-color ones at Dreams Yarn Shop at Glorietta 5 too, but they may not have slow-changing ones (like the Chroma ones or the Bernat Mosaic/Lion Brand Amazing yarn). Wow! You're really good at crocheting.. Did you make that red, yellow, green scarf? I really like it.. Are you selling your creations? I'd love to buy .. Thanks! Aww... you're being kind :) I have since gotten better but I'm afraid I'm still a work in progress.